In a sweeping tale of brand confusion, our penniless hero NPR and rich merchant Urban Outfitters collude to sell a T-Shirt bearing NPR’s logo. But the saga has a dark twist: Urban Outfitter’s actions could financially kneecap NPR. Promoting a brand nowadays seems to be all about being consistent, on-message, slick, and intelligent. But sometimes a promotional campaign goes utterly off the rails. Case in point: Urban Outfitter’s version of NPR’s understated gray “Get Smarter” promotional T-shirt. In an attempt to reach hipsters and potentially the youth market, NPR sells a T-shirt on its website that should appeal to those demos (if iDevice-addicted teens are even aware of NPR’s existence, that is). It costs $20, and the profits fund National Public Radio directly. But the same shirt is available at Urban Outfitters online, and a slightly different one is on sale in their bricks and mortar outlets. 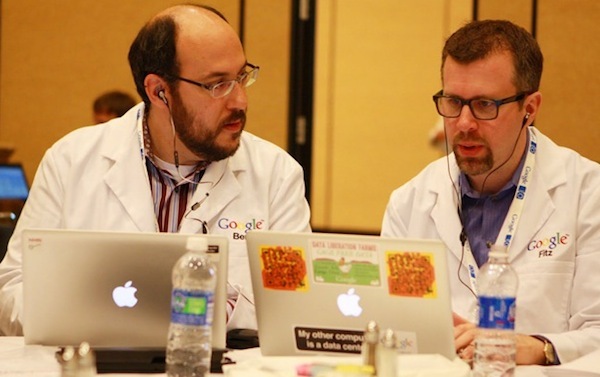 It is, says the site, “a great tee, all things considered. 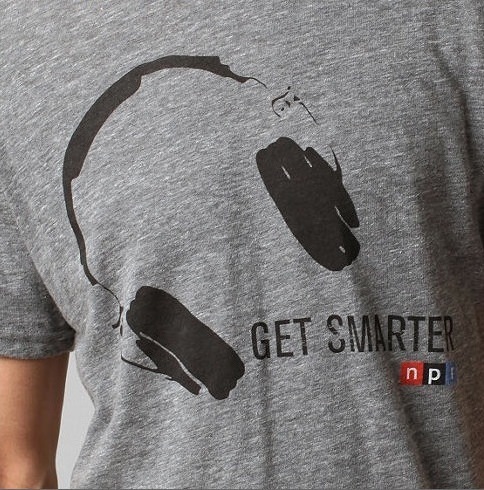 Soft heathered tee with Get Smarter NPR graphic at the front. Made in the USA. Machine wash.” It sells for $24. But instead of benefitting the perennially begging-for-bucks NPR, that money goes to Urban Outfitters and its supremely well-funded owner Richard Hayne. We can imagine that NPR sees the Urban T-shirt as an exercise in brand-awareness, and its presence on Urban’s trendy hipster shelves will probably get noticed. But the fact that NPR promoted the Urban version of the T-shirt with a tweet stating “NPR T-shirt available at Urban Outfitters ($24 for local station encouraged first, tho)” is where the brand message gets a bit confusing. NPR is suggesting that prospective T-shirt buyers hand over $24 as a donation to their local stations, and then spend another $24 on the shirt at Urban…rather than simply promoting its own version on sale at its own shop, for its own profits. Things get even weirder when you look at the reviews of the shirt on retailer’s website–one of which rates it at four out of five stars and notes “I bought this for my dad, who loves NPR and had no idea where I had found it! (My secret.) […] Great gift for anyone who loves this radio station or cool music in general.” Seems real NPR fans would appreciate the same garment more if they knew it funded their favorite radio station. And then there’s the fact that Urban’s president and founder Hayne is the 262nd richest person in the U.S., making his millions off various retail brands that include Urban Outfitters and Anthropologie, among others. Hayne is a longtime loyal Republican Party backer, and he’s raised plenty of money to help his GOP politico pals–totalling over $50,000 in 2008, plus his own personal donations. And, if you remember, the Republican party has a big push on at the moment to rid the U.S. taxpayer of the horrendous burden of funding a smart, informative national public radio station. Can you say “brand conflict”?